Blaseygate is the new meme that represents a manufactured scandal by Deep State, especially the Democrat side of the Shadow Government. There is also a Republican Deep State that is involved in this psyop that RINO Sen. Jeff Flake belongs to. First and foremost Blaseygate is a rogue C.I.A. black op against the SCOTUS, but it’s also a major manufactured distraction. There are obviously many layers to this Blaseygate psyop but one of the most important was to function as a HUGE distraction from the massive Democrat crime wave that has been rolling over America since Obama’s first inauguration. That crime wave became a towering tsunami right after Trump declared his candidacy in June of 2015.
national conversation from their fictitious ‘Trump-Russia collusion’ debacle. pretext to overthrow the POTUS, as well as to start a World War with Russia. All the evidence has been stacking up which indicates a primarily Democrat criminal conspiracy to fabricate a false case against President Donald Trump for colluding with Russia to fix the 2016 U.S. Presidential election. 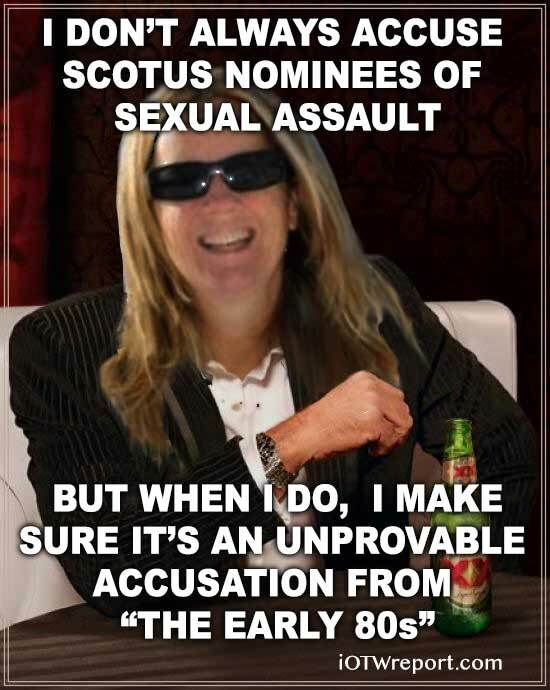 It never happened, but the Democrats made it up anyway. The entire non-existent case was contrived out of thin air. Once the agents of the Democrat Deep State perpetrated all the crimes necessary to create the illusion of this bogus Trump scandal, they unavoidably found themselves in deep doo-doo. And when the House committee releases the hidden yet hard evidence of a highly organized coup d’état, they’ll be toast—Mueller, Comey, Brennan, Clapper, Hayden, McCabe, Strzok, Page, Ohr, Schiff, Waters, Schumer, and, yes, Obama and Clinton. Since the totally corrupt Mueller investigation was first launched, the Democrats have done everything within their power to cover up their massive Russiagate crime spree. However, the more they covered it up, the worse things have gotten for them. Now the DEMs are at a point of extreme desperation whereby they feel they have no choice but to win back the House and the Senate…for survival’s sake. They know that the very existence of the Democrat Party hinges on controlling all 3 major branches of the U.S. Federal Government from this critical point forward. Hence, we see many multifarious moves and maneuvers to take complete control of the U.S. Congress, the U.S. Supreme Court and the Executive Branch. The ‘Trump-Russia collusion’ fiasco was their attempt to take over the White House—literally. The numerous Democrat schemes to steal the upcoming midterms elections are an attempt to reassert their leadership in both chambers of Congress. And their criminal conspiracy to character assassinate SCOTUS nominee Brett Kavanaugh is their rogue CIA-directed operation to dominate the Supreme Court. There are several major events that took place over the month of September which many people were unaware of. There are several other highly consequential happenings in the offing which will irreversibly alter the global order in fundamental ways. Because of their profound effects on the United States, and in an effort to hide the “new normals” coming to America, Deep State is forever hatching sensational plots of distraction, diversion and misdirection. It ought to be obvious even to the uninitiated that the Blaseygate scandal was completely avoidable, as well as quite deliberately engineered to make the Democrats look bad—REAL BAD! When an open letter to the C.I.A. is posted on the Internet about this transparent psyop, you know things are about to get very hairy indeed. See: An Open Letter to the C.I.A. Not only has Blaseygate exposed the sheer criminality and revolting corruption of the Democrat Party, it has revealed the inner workings of the now notorious Deep State. 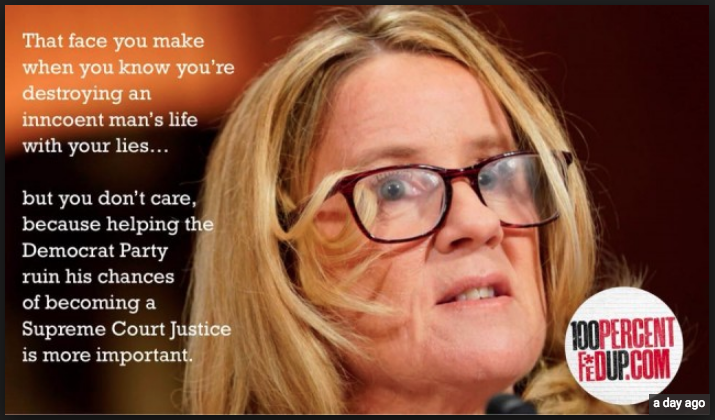 The American people are receiving an extraordinary crash course in how the Democrat Deep State routinely manipulates the electorate through sensationally levying false accusations against innocent victims. As a matter of fact, the DEMs do this every election cycle, but very few are aware that the preferred candidates are being character assassinated with liberal premeditation. The decision-maker perps at the very top of the pyramid have as their goal the imposition of a whole new set of legal standards. A new paradigm of “communist era justice” is likewise being rolled out. For example, the accused citizen is now guilty until he or she proves themselves innocent. Any woman who lodges an allegation of sexual crime is to be believed unquestioningly, without an iota of evidence. The white male, in particular, is always culpable unless they can produce conclusive proof showing otherwise. With the unfolding of Blaseygate, the USA is truly witnessing a full-blown revolution being carried out by political bolsheviks. Unlike the Bolshevik Revolution of 1917, this one is being fought on the Internet. Whereas the cyber battlefield this past Friday, Sept. 28 was the Senate Judiciary Committee meeting for the Kavanaugh nomination, the actual battleground of this epochal war is the entire World Wide Web. The Democrats know that the continuity of their political party relies on a successful outcome. Their official and unofficial misconduct has shown them to be — individually and collectively — completely unfit to lead the country in any capacity. Not only do they lack any moral compass, they are hopelessly incompetent and willfully negligent as the Democrat-ruled state of California graphically depicts. In light of what is at stake for both parties on November 6, the nation will experience an October Surprise — or rather a series of October surprises — like none other in our history. See: The October SURPRISE of 2018 to be Preceded by a September SHOCK & AWE! In point of fact, there’s so much riding on so many weighty outcomes, which are all peaking during this month, that a “roller coaster ride from hell” is all but inevitable. That’s not bad news, as the body politic is in dire need of a purge. Sometimes the only way to get the job done is through a major catharsis; for only a deep cleansing of the entire political class and governmental sector will suffice at this momentous time. Bottom Line: The Democrat Party can never be permitted to hold positions of government leadership again. They cannot be trusted to govern at any level. They have deeply betrayed the American people and violated the public trust. When the social contract has been irrevocably broken by one side, it must be discarded. The intensifying Democrat soft coup against Trump alone has revealed an irreparable breach of the covenant between government and the governed.